The Old South Haven Presbyterian Church organ was built by Hinners of Pekin, Illinois ― sometimes called the "Ford" of pipe organ makers because they enabled many small and moderate sized congregations to have truly elegant instruments. While no clear Opus marking has been found on the instrument, a partial marking on the case suggests that it was Hinners Opus 155?. An Organ Historical Society database suggests a build date of 1913 for the Dutch Reformed Church of West Sayville, NY. This date is consistent with the possible opus marking. Immediately prior to its present installation in the Old South Haven Church building in 1961, it was sited in the Brookhaven Presbyterian (formerly Methodist) Church building. 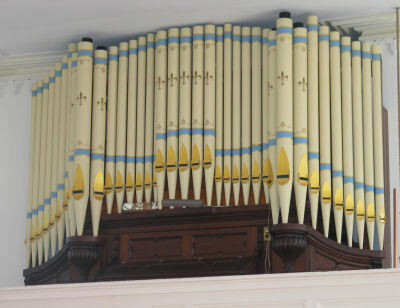 Before that, local residents say that it once had been installed in a church "further west," perhaps at "Sayville, NY," consistent with the Organ Historical Society record. In 2006, it was fully renovated by the J.S. & C.H. Odell Organ Company, and continues to glorify God and support the worshipping community of the Old South Haven Presbyterian Church into the twenty-first century. George Borthwick's history of the South Haven Presbyterian Church written about 1939 records that a "pipe organ, which Mary Floyd Ireland had given to the church several years before this time [circa 1860], was installed in the niche in the center of the balcony." The Ireland organ was later removed by Mrs. Ireland because "it was little used and considered old-fashioned," having been replaced with a reed organ located on the main floor in a new choir stall at the front ― reed organs were becoming popular with the Victorians. This reed organ can be seen in 1930's photographs of the South Haven Church interior, and was still in possession of the parish into the early 1970's. There has been some diversity of opinion as to where the present Hinners organ was originally sited. While there is universal agreement that the organ's first home was not in the Brookhaven/South Haven Hamlets, some "old timers" are adamant that it's second home was always in the South Haven, NY, Church building. However, it is well documented that it's second installation was in the Brookhaven Hamlet, NY, Methodist Church building. The confusion likely arises because, between 1945 and 1961, there were two church buildings in the South Haven Presbyterian Parish, both of which were used for worship services -- at least initially. 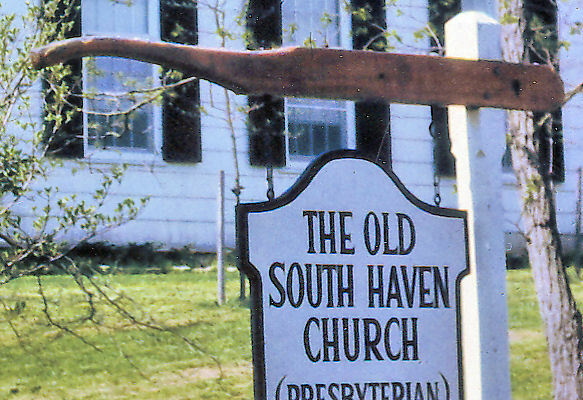 This came about when, through a transfer of properties between the Methodist and Presbyterian denominations, the South Haven Presbyterian Parish took possession of the old Methodist church building in the Hamlet of Brookhaven, about three miles east of old South Haven church building (the Methodists at the same time took possession of the then independent Bellport Presbyterian Church property in a separate coordinated transaction). The Brookhaven structure was said to have had better facilities for worship and meetings, and gradually became the principal church building of the parish. The 1823 South Haven church building became disused. The Pastor's report in 1960 indicates that the South Haven church had not been used at all in 1959 (and earlier). While the Trustees and Session minutes of the parish rarely make it clear which of the two buildings was being referenced, expenditures for an organist and organ maintenance are recorded throughout the 1950's. Since the South Haven building was rarely used, the referenced organ must have been in the Brookhaven building. A recent communication from Theodore Gilbert (who worked on the organ in 1949) recollects "that the instrument was installed on the left side of the podium in the front of the church." Photographic evidence records no such chamber in the South Haven building. While photographs of the interior of the old Brookhaven building likely exist, none have so far been found. Records of the Brookhaven hamlet Methodist congregation have not yet been examined. Bellows Signal, now switches power on/off. In Dec, 1960, the historic South Haven Church building was moved the three miles from South Haven to Brookhaven. Session minutes of August 4th, 1961 record that "the pipe organ should be moved to the new site." An article in the Patchogue Advance (16 Nov 1961) states: "The church's pipe organ is being dismantled, repaired, transported and reassembled by the Midmer-Losh Organ Co. of Merrick. It will be snugly fitted into the balcony of the church." The Trustees minutes of Feb. and March 1962 mentions the empty organ niche at the "Brookhaven" (e.g., old Methodist) building. The Brookhaven building was soon thereafter sold and became a private residence. The organ is two manual, seven ranks tracker action except for the pedals which were originally electro-pneumatic. The electric action may be a later modification. By the late 1980's, the Pedal action had become unreliable; and by the late 1990's it was unusable. In 2006 the electro-pneumatic action was replaced by an all electric action. The original bellows for the organ was hand pumped; the old pump handle was for many years incorporated into the church sign in front of the building, but eventually deteriorated. 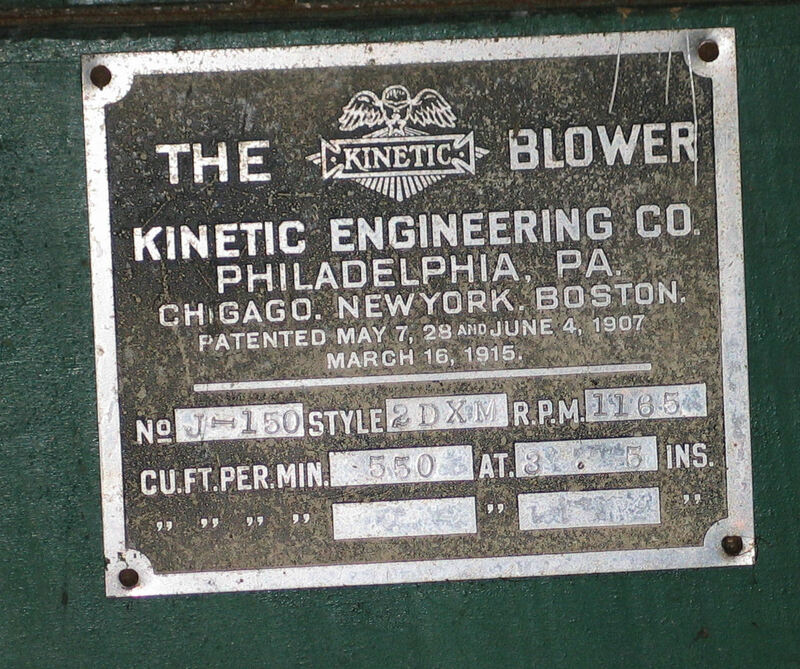 An "old" Kinetic blower, with a patent date of 1915, was installed about 1949 by Theodore Gilbert, replacing an older Buffalo Forge blower . This blower, which was unsatisfactorily installed in the unheated dirt crawl space under the church when the organ was moved in 1961, was replaced in 2003 by the Elsener Organ Works of Deer Park, NY with a modern blower located within the organ gallery. The original reservoir was replaced by Russell Minerd of Scarsdale, NY in 1986. The façade before the 2006 renovation. 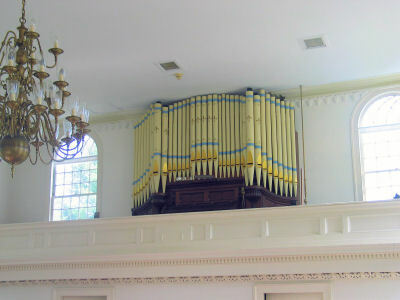 Note three mitered pipes of the Open Diapason in the façade, probably done in 1961 when the organ was moved to the Old South Haven Church building in order for it to fit it into the steeple niche. There were also two mitered pipes behind the façade. The Odell Company converted all the mitered pipes to Haskell pipes and reshaped other pipes to a more pleasing design. The seven pipes to either side of the pedestals are non speaking pipes. 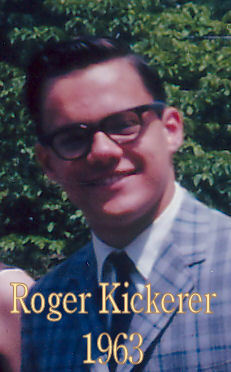 In 2006, the church embarked on a major renovation program thanks largely to a bequest from former member Roger Kickerer. In July, the J.H. & C.S. Odell Organ Company were contracted to refurbish and repair the organ. 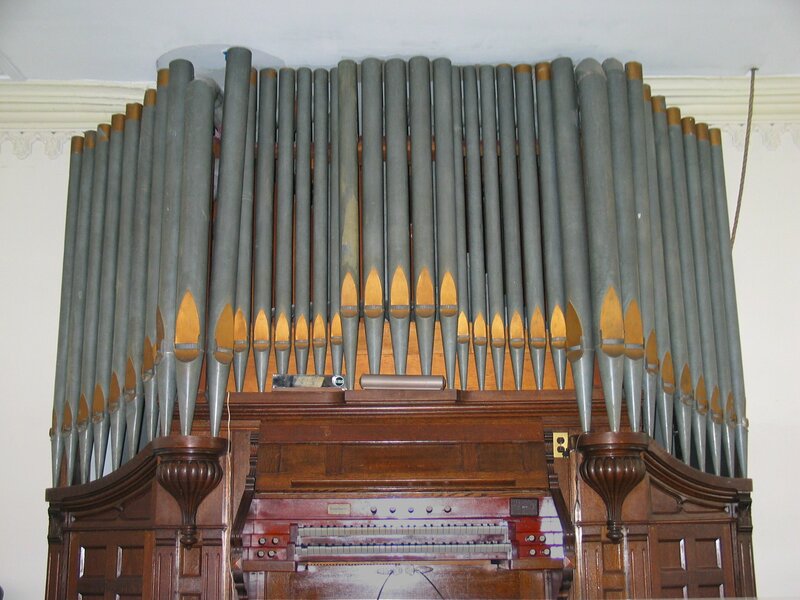 Work included a new windchest for the Pedal division with direct electric action and dc electric power system, relocation of some pipes to facilitate maintenance and tuning, and extensive repairs and tonal finishing for the rest of the organ. A separate memorial contribution was provided for the redesign and decoration of the pipe façade. On August 7th and 8th, 2006, the instrument was dismantled and shipped to the Odell company for refurbishing. On 12 November 2006, the organ was returned to the church and reassembled. The renovated organ accompanied worship for the first time on 3 Dec 2006 -- the first Sunday of Advent and a new church year. The Hinners firm was in business from 1879 until 1936. They built pipe organs with tracker action and with tracker and electro-pneumatic action. They seem never to have produced a purely electric action organ. John Hinners (1846-1906) the founder of the company was of German parents who, it's recorded in Orpha Ochse's The History of the Organ in the United States were German Pietists and came to America in 1836. John served in the Civil War and then went to work for the reed organ division of Mason and Hamlin the famous piano builders of Boston. Hinners moved to Pekin, IL, in 1879 and after working for the reed organ builder for two years formed the organ building company in partnership with J. J. Fink. In 1885 Fink was bought out by U. J. Albertsen, and the company began to build organs under the name of Hinners and Albertson. They built small, reliable and inexpensive organs available only through their catalog. They never employed a salesman. Their system was compared in later years to Henry Ford's building of automobiles ... building organs for small churches. At one time Hinners and Albertson are said to have had a waiting list of over three thousand customers. From 1890 until 1936, the Hinners company are said to have built some 3000 pipe organs, mostly one and two manual instruments. "For $485.00 we deliver this organ, one manual with four divided stops on the manual and an independent 15-note pedal bourdon. The organ arrives securely packed in boxes and crates on railroad cars or steamboat. "Added to the cost is freight and www.imitationraybanuk.com the round-trip fare for one of our men to assemble, set-up and tune the organ. We make no charge for the time to do this work... only the traveling expense." In 1902 Albertsen retired. In 1906 John L. Hinners retired, and his son Arthur W. (1873-1955) succeeded as president. Under Arthur the company had its peak year in 1921 when 97 employees were working at the factory. The depression brought the company to its end in 1936, and Arthur went to work for the Wicks Organ Company as a salesman. The company built only tracker organs until 1910 when it built its first tubular-pneumatic action and in 1916 its first electro-pneumatic instrument. Hinners also built theater organs (oddly enough a five rank tracker!) beginning in 1911. All told they built twenty theater organs, some "quite large". Until 1920 Hinners never built their own pipes... their supplier was Anton Gottfried of Erie, PA.